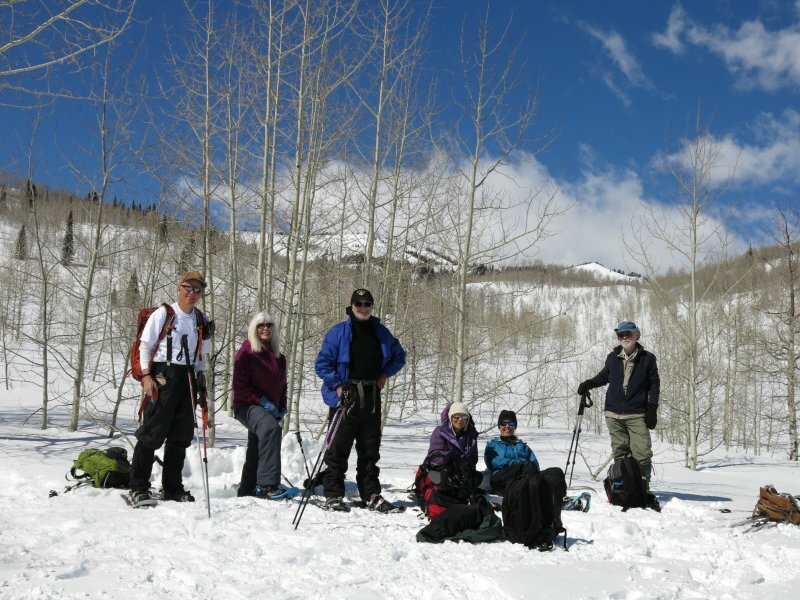 Seven Cache Hikers enjoyed this pleasant ski/snowshoe trip to Bunchgrass Creek. Snowshoers included Diane, Joe, Jane, Tim and Jeanne, while Dave P and trip leader Dave W were on skis. Recent mountain storms promise good snow conditions for several more weeks, but this will be our last trip of the season since it is becoming too hard to resist the fine spring weather down in Cache Valley. We drove up Logan Canyon to the Bunchgrass Trailhead, about a half-mile beyond the Tony Grove turnoff. 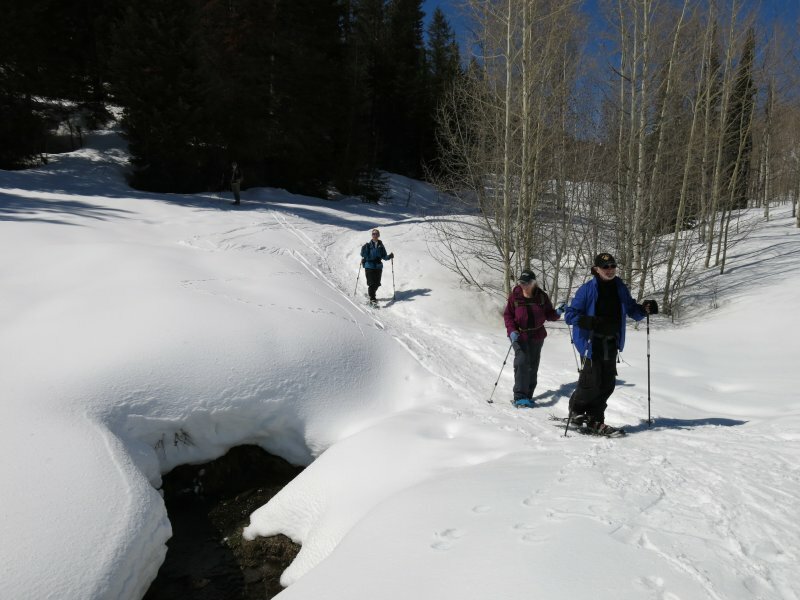 After carrying our skis and snowshoes across US 89, we headed up the hillside to join the Bunchgrass Creek trail. Usually we cross over Bunchgrass Creek on a snow bridge, but there was so much snow that the creek was almost completely covered. Also, there was no trace of the the large trailhead sign that was here in past years. The sunny skies were tempered somewhat by a chilly breeze, and while we had to climb over a newly fallen tree that blocked the trail, an inch of new snow over a hard crust below made easy going for skiers and snowshoers alike. Our lunch stop was Goring Pond, on the edge of a large meadow 1.9 miles up the Bunchgrass Creek Trail. We lounged a bit at lunch, prolonging the pleasure of the moment before heading back down. 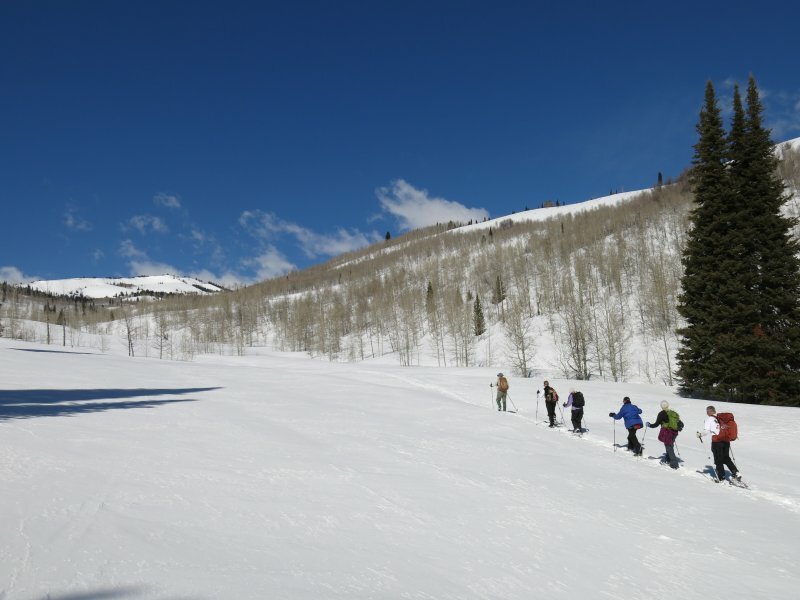 The fast snow conditions and moderate grade caused the skiers to fly down the trail, but they stopped periodically so the snowshoers could catch up. We also encountered a number of enthusiastic skiers and snowshoers along the way.